Infrared Thermal Imaging is an advanced, non-invasive technology that allows the inspector to show the client things about the home that can't be revealed without using thermal imaging inspection methods. Air tightness and energy efficiency is an important concern when purchasing or renovating a home. Heat loss can account for up to 50% of total energy consumption in a building with causes ranging from air leakage through chimneys, attics and wall vents to missing insulation and badly sealed doorways, to degraded argon gas in thermal windows. Adequate air exchange is important for occupant comfort, health and safety, but most buildings have a far higher rate of air leakage than necessary. The root cause is often poor design and/or construction which allows air to leak in or out. Also, missing or degraded insulation will allow thermal energy to readily transfer through the building envelope. Without thermal imaging, the source of these drafts/energy losses can be extremely difficult to detect and visualize. But with our thermal imaging techniques, ProSpec Home Inspectors can locate and uncover sources of energy loss, leading to helpful advice on the best improvements and corrective repairs. energy and save considerably on utility bills. Thermal imaging cameras are well-established as valuable inspection tools that help reveal the hidden deficiencies. By detecting and locating patterns and sources of heat loss that are not visible to the naked eye, thermal images provide convincing evidence in our reports where improvements need to be made, and/or how well they’ve been completed. 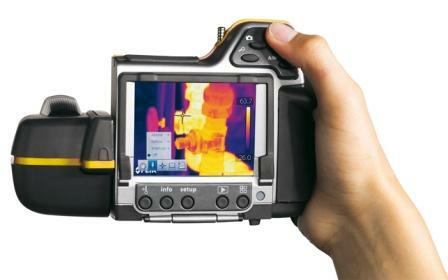 Thermography measures surface temperatures using an infrared camera. This camera captures images that show variations of light within the heat spectrum. The thermal images also record the surface temperature variations of the building's envelope ranging from warm areas (brighter shades) to cooler areas (darker shades). The resulting images help the inspector determine whether insulation or corrective repairs are needed. Thermal imaging also serves as a quality control tool, to ensure that energy conservation upgrades have been performed properly. A thermographic inspection is either an interior or exterior survey. The inspector decides which method would give the best results under certain weather conditions. Interior scans are common, because warm air escaping from a building does not always move through the walls in a straight line. Heat loss detected in one area of the outside wall might originate at some other location on the inside of the wall. Also, it is harder to detect temperature differences on the outside surface of the building during windy weather. Therefore, in those cases interior surveys are generally more accurate because they benefit from reduced air movement.